Tool to Import EML Files into Microsoft Outlook 2019, 2016, 2013, 2010 etc. 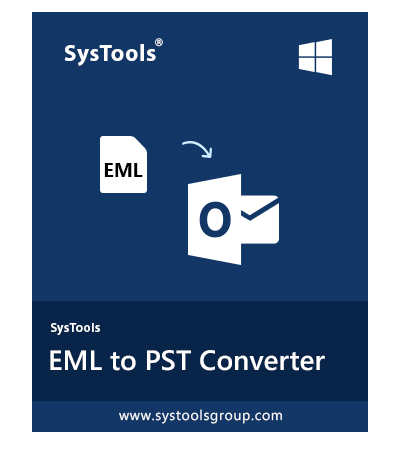 SysTools EML to PST Converter allow to export EML to Outlook including items such as emails , attachments at once. The software supports to transfer Windows Mail, WLM, Outlook Express .eml files to Outlook PST with no data loss or corruption issues. The software makes eml to pst conversion process easy and facilitate to import eml to Outlook 2019, 2016, 2013, 2010, 2007 and below versions in hassle free way. SysTools EML to Outlook Migrator tool is the recommended software among various others as it has the best performance for batch export EML file. 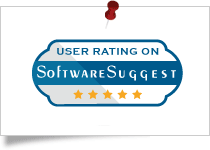 SysTools EML to Outlook Importer Software got the 4 stars rating from Cnet for its efficient working. Use this software and export files problem free way. 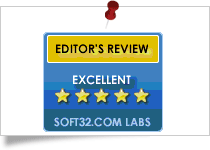 Soft32 provides SysTools EML File to Outlook Migrator Software gets 5 star rating for being the most effective product for importing items of a EML file. SysTools EML to Outlook Converter is the best software to export multiple EML Files to PST format without any hassle. The tool is compatible with All Windows OS and Supports Microsoft Outlook 2016, 2013, 2010, 2007 and below versions. It got 4.5/5 rating for problem free working. Importing EML to Microsoft Outlook is not an easy task. But due to EML to PST conversion tool the user can convert multiple .eml files to .pst file format. After successful conversion, user can import resultant file into Microsoft Outlook 2016, 2013, 2010 2007 and below versions. Being an IT Admin, I was appointed to migrate 200 user’s .eml file into Microsoft Outlook mail client. I tested many utility in my lab and found, SysTools EML to PST converter is best among all. I used this software and easily exported complete user mailbox. It worked problem free for me. I will recommend this utility for every user. EML to PST Converter is designed in such a way that it supports to migrate several EML files into Outlook PST file type in a single go. It allows to add multiple EML files or even a folder that comprises various EML files and the software will auto-load all the emails of that folder along with all attributes. From the list of added EML files, users can either select and convert only some selective emails or convert all EML emails into PST in bulk mode. No matter how many EML files you want to convert into PST, the tool will export all of them in a few minutes even without any data manipulation. Later, resultant PST can be accessed with MS Outlook. There come times when users use to insert images within EML file text. So, all the EML files that include inline images, that are added within the email body also gets exported using this EML to Outlook Converter. The software is capable enough to export all type of inline images regardless of their format such as .gif, .png, .jpeg etc. There will be no modifications in the rich-text formatting of EML emails and all the images, color, email text, line, font, hyperlinks, and body structure will remain same after EML to PST conversion. In addition, the software does not make any changes in the meta properties of EML file emails. Why Don’t Use Free Methods to Import EML to Outlook? Note: - To overcome all these issues, use SysTools EML to PST converter for safe and secure conversion. You can also take help of Our Experts 24X7 and import EML messages into Microsoft Outlook in hassle free way with 100% security. Initial screen of EML to Outlook exporter software gives you a windows explorer style view. From the left pane; you can select the folder having EML files and all of its emails will get auto loaded with item count. The EML file to Outlook migrator tool generates an instant preview of email messages before importing EML to pst simply view in different modes like: Normal, Hex, property, MIME, HTML etc. .
An In-built viewer facility in the software also generates an instant preview of attachments of corresponding EML file before transfer .eml files to Outlook. Software enables you to import emails along with attachments into Outlook. On the EML to PST conversion you can sort the emails by its attributes properties like To, From, Subject, Sent Date, Received Date and Size in KB. Select the required emails only and the transfer EML to Outlook. This EML File to Outlook converter tool provides you with an option of splitting PST file by its size into multiple smaller parts. If you select this option, the resultant PST file will be divided into multiple parts; all of the mentioned size. The software supports all the email client platforms that save data in EML file format. All email clients supporting EML files are fully supported by the EML to Outlook, like Windows Live Mail, Outlook Express, Edura, Thunderbird etc. You can change the view mode of screen from horizontal to vertical and vice versa. By default the software preview for emails and attachments is set to horizontal screen view mode which can later be transfer as per the requirement. While exporting EML files into PST format, the software creates a Unicode type PST file by default. This helps in storing large number of emails as Unicode PST belongs to Outlook 2007, 2010, 2013 and 2016. It has capacity to store up to 20 GB of data. The Software to migrate EML to Outlook allows you save the resultant PST file to any desirable location. Alternatively, you can also make a new folder through the software as you browse for a location to save PST file. The free demo version of SysTools EML to PST Converter Tool will export only 10 Emails from each folder. How to transfer EML files to Outlook using this software? Step 6 –: Import EML files into Outlook 2019, 2016 / 2013 / 2010 / 2007 / 2003 etc. Is Outlook installation necessary for converting EML files to Outlook format? "I am trying to export old EML files to PST format on Windows machine. Do I need to install Microsoft Outlook before exporting .eml files into .pst file type?" No, Outlook installation is not mandatory to convert EML Files to PST. Software will create PST file independently. But if you want to further open the PST file, then you will need to have Microsoft Outlook installed and configured properly. Can I convert my EML file to PST on Windows 10 platform, using this tool? "I have some EML files that belong to Outlook Express and are now available on my Windows 10 machine. I want to convert it into PST file so that I can use it in Outlook 2016. Can I go for EML to Outlook PST conversion tool?" Yes, you can use this converter for converting orphan EML files also. Why am I receiving an error while opening PST file created via the software? "I have purchased EML to PST Converter full version and converted few EML files. But when I try to open output PST file it says "Outlook Session Creation Error". Why is this happening?" In case of receiving this error, please check whether Outlook is installed / configured properly or not. If not, make sure you install Outlook and configure it with a POP3 or dummy profile. Once this is done, launch Outlook, go to File menu » Open » click on Outlook Data File » browse your PST file and click on OK. The resultant PST file will be in UNICODE file format after EML to Outlook migration and can be opened in Microsoft Outlook 2019, 2016, 2013, 2010, 2007, 2003 versions. Can I try this software for free before buying full version? No, We offer this software in two versions; Demo and Licensed versions. Using the Demo Version of the EML Files to Outlook Exporter Tool, you can test its performance beforehand and make sure that you are investing on the right solution to combine EML files to pst. Full version export unlimited EML to PST. Can I convert multiple EML files to PST file using this converter tool? Yes, you can export batch EML files to PST file using our converter tool free version and full version. Will this application keep the structure of my folders & messages the same as original? "I have tried many tools for EML to Outlook Data File conversion but when I see the output file, they show discrepancy in the formatting of the content. Will this converter maintain the formatting of my messages/ folders?" Yes, The EML to Outlook PST Converter tool maintains Message Formatting & Attributes and also maintains On-Disk Folder Hierarchy. Simply import the resultant file into Outlook and explore the folders. Can I export some of my important folders (not all the folders) of EML file to Outlook Data file? Yes, using this Converter, you can migrate selective eml files to PST file. Does the software impose any size limitation on output PST file? No, there is no such limitation on size of PST file that the software creates. Size of output PST file depends upon the size and number of source EML files converted. After successful conversion you can migrate EML files to Outlook PST. Is MS Outlook installation required, to export EML Files into Outlook? No, The Software support to convert EML to pst without Outlook installation. Is this converter software capable to import emails with attachments into Microsoft Outlook? "I tried free tools to export EML files to Outlook pst format. But all of them failed to export attachments. Also the images are distorted in resultant file. I want a perfect solution for converting EML files to Outlook." Yes, the SysTools software is ultimate solution for converting EML files into Outlook pst file format along with attachments and other email attributes. Also this software will not affect the images and mail SMTP headers. Free methods are available in market. Why do I use your software to transfer EML messages into Outlook? I agree with you, But the free conversion methods are time consuming and not secure. Also it may result to distorted SMTP headers, Images may get broken etc. To avoid these kind of data loss situation. You should go for trusted and licensed version to transfer EML file into Outlook. I have stored bunch of EML Files into my Pen Drive and want to import in latest version of Outlook. Is you software capable to migarte EML file from external storage device?. Yes, The software support to export EML files into Outlook from external storage device. For this launch the software and explore your external device. After that select the folder containing .eml files. Now export EML files into pst format and import in any version of Microsoft Outlook (2019, 2016, 2013, 2010, 2007 etc.). After converting EML file into pst format, the images and graphics from message body are missing. What should I do? "I imported .eml file into Microsoft Outlook 2013 by using WLM Import/Export feature. But the images and graphics added in .eml message body is missing. What should I do?. One more thing I saved the same .eml files as backup before proceeding with this manual trick." You kept backup, is make your data alive. Otherwise you just loss your valuable data. These are the limitations of manual tricks and free solutions. 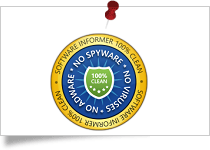 Due to which we always suggest to use trusted and professional software. Now try SysTools EML to PST Converter Tool and export complete data without any limitation. Can I import multiple .eml files into Outlook 2010 using this Software? "I have bulk of .eml files, which I want to move in Outlook 2010. Will this software help me to export EML to Outlook." Yes, Importing EML to Outlook become quite easy By using this conversion tool. It helps users to import multiple EML to Outlook at once. Most of the options with with this converter tool are highly user friendly and the one that I really appreciate is the option to save EML to Default PST, because it help to save time in importing PST files separately so that it can be accessed with Outlook. I am so thankful for the support executives and the developers of the product for making such a wonderful tool available for me like novice users. I had kept wondering on how to export EML to PST (Outlook data file) without losing formatting of my messages. I came across this utility from SysTools, it converted the files in an easy way & was less time consuming too. Hats off to the team for developing such a user friendly software. I suggested this tool to my friend also, here used the and easily completed his task EML to PST. I will keep it in my cart! EML to Outlook converter tool is superb application and works very well as it saved my lots of time and efforts. I have lots of EML files that I required to open with MS Outlook, so I want to convert them into PST format. With the support of this software I did fruitfully migration of .eml to Outlook PST (2010). It really works for me, I suggest you to download it’s free version first and check working. Always it used to be challenge for me to utilize any software applications but, I am highly impressed with working of this EML to PST file converter. The application provides a straightforward approach to transfer EML to Outlook platform with maintenance of the existing data. No technical guidance is required for moving emails from Windows Live Mail to PST format in a very simple way. I am using Microsoft Outlook 2013 on Windows 10 OS. My friend gave me bulk of .eml files, which I want to import in Outlook 2013. 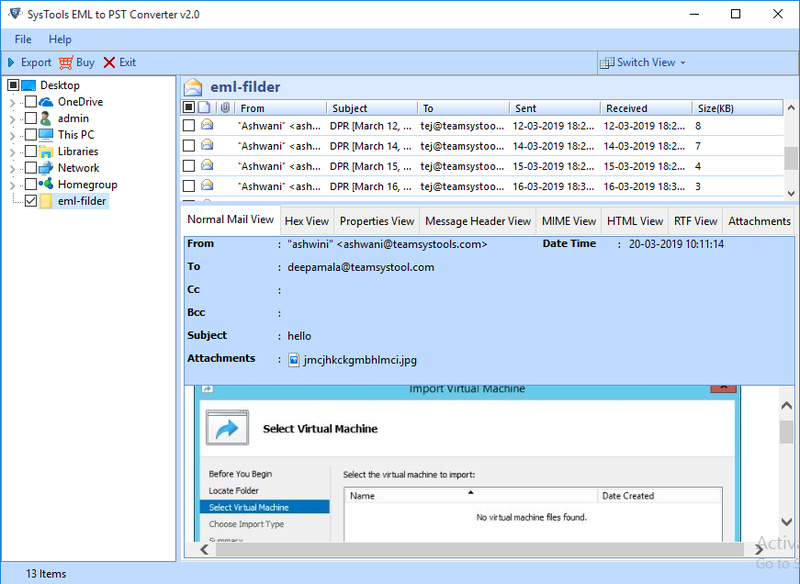 For that I used this EML to PST conversion tool and it helped me a lot to move EML to Outlook, in quick and easy steps. The tool is capable to export complete emails messages with maintaining HTML formatting. Also, it is capable to convert complete data from .eml to pst. Thanks in developer! Step 1 –:Download and Launch EML to Outlook Converter software on your Windows computer. Step 2 –:The Software will show you complete folder, simply explore and view. Step 3 –:Select PST file and export complete bulk file from EML to PST. Step 4 –:View the export process completed successfully. Know How to Import EML Messages into Microsoft Outlook? Know How to Transfer EML to Outlook?